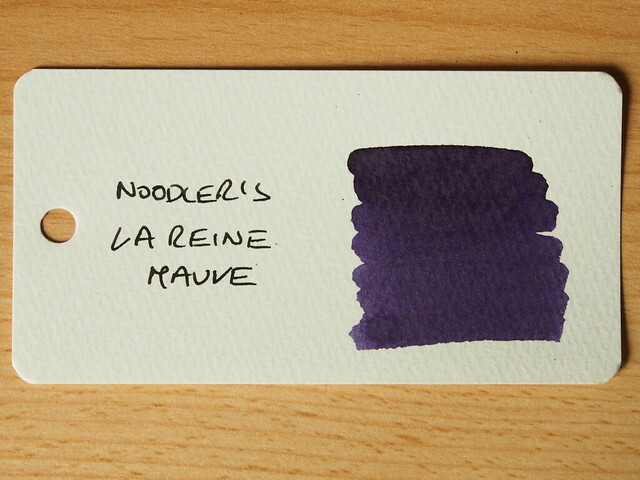 For the next in this batch of ink reviews we have another with a French name – Noodler’s La Reine Mauve – which also links to aristocracy and revolution. This is an “Eternal” ink with features to defeat forgery. 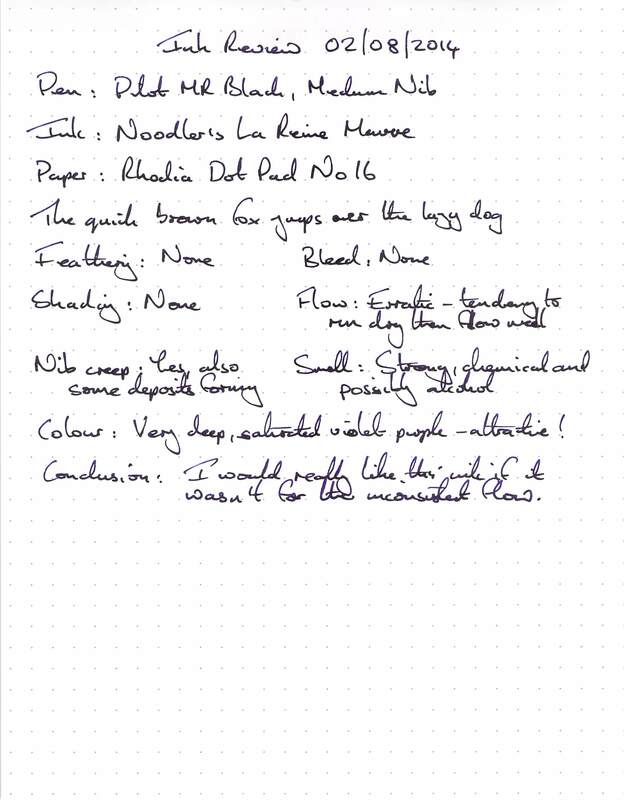 Unlike other similar inks I have tested recently I could actually see myself writing a cheque with this one. According to its label, this ink is also “guillotine proof”, but that doesn’t form part of my test suite, so I cannot confirm this property. 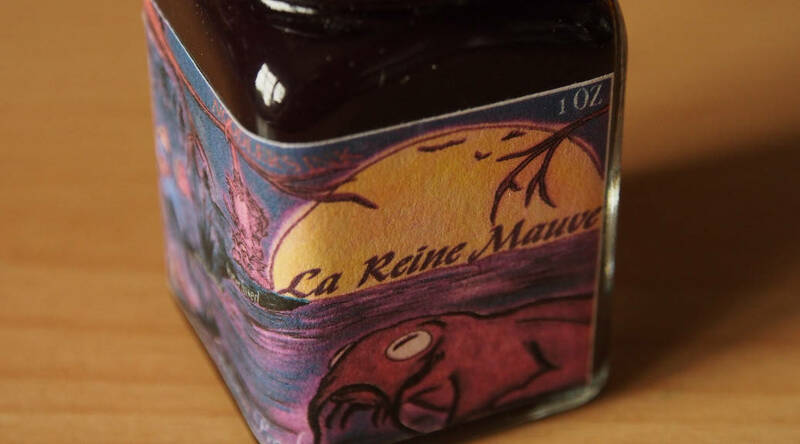 Apparently Marie Antoinette loved purple, so she is depicted (decapitated) on the hand drawn label, offering a plate of cake to what looks like a possum hanging from a tree and a large purple catfish. It’s a strange image, so I won’t dwell on it any more. This bottle came from a US supplier (not my usual Ebay store) and picked up higher than usual shipping charges. 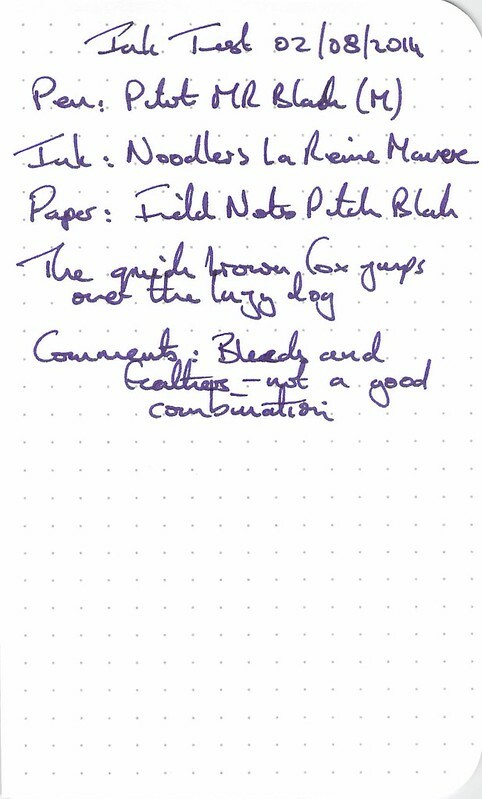 Coupled with the fact it comes in a 1oz bottle (for the usual price of a 3oz bottle) I have to class this ink as expensive. The dinky 1oz bottle still has the same cap and neck associated with a 3oz bottle, so filling a pen is not a problem. The box is a scaled down version of the usual black line art on white box (but with less detail). 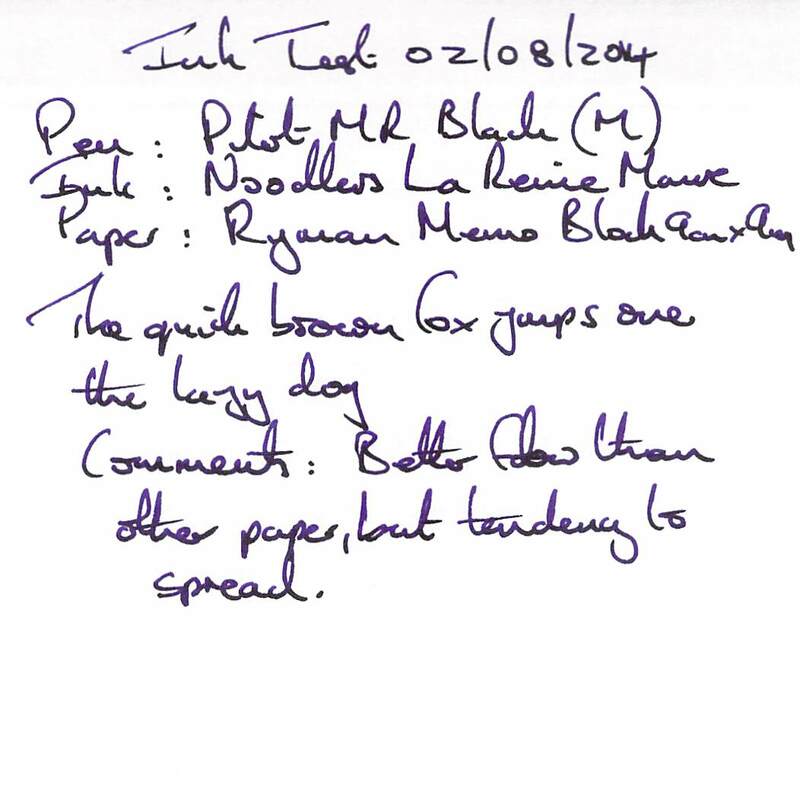 The test pen was a Pilot MR (medium nib). Water resistance was very strong. 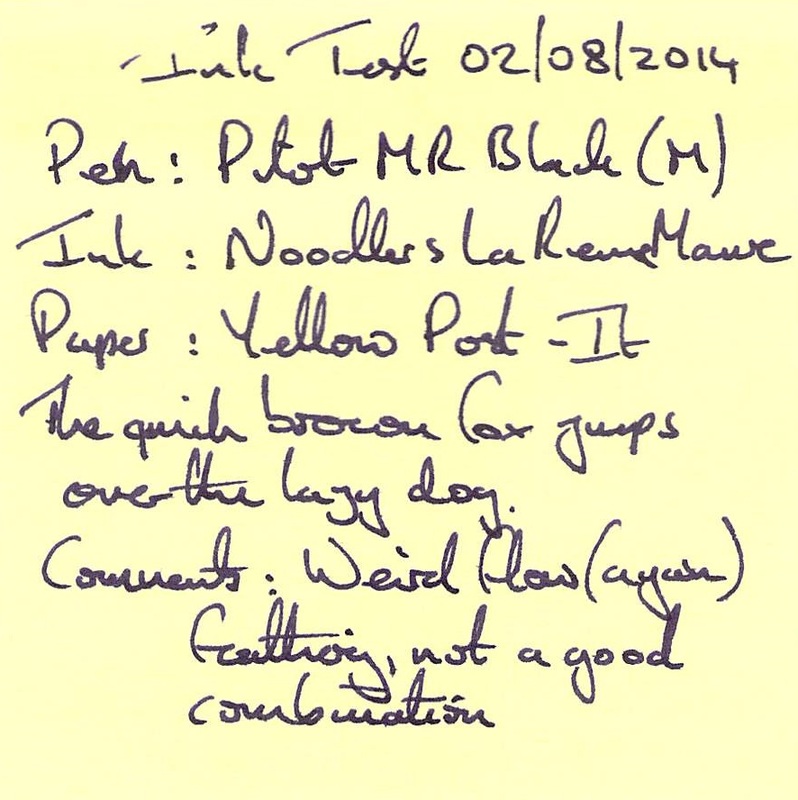 Cleaning was difficult – it took a lot to shift the last traces of the ink especially from the feed – where it seemed to have partially congealed. Dry time was extended at about a minute. This is a truly beautiful ink, with a colour that I would describe a stormy violet purple. On this paper it is very dark. The main problem is the weird ink flow – varying from on the dry side to almost too heavy, giving an unpredictable line width. Ink flow on this paper was better and more consistent – but with a tendency to spread, giving too thick a line. Flow was erratic again, skipping completely at the start, which along with feathering didn’t give a satisfactory experience. Heavy feathering and bleed – again not good. This image really shows the deeply saturated purple, but leans slightly more towards blue than in reality. 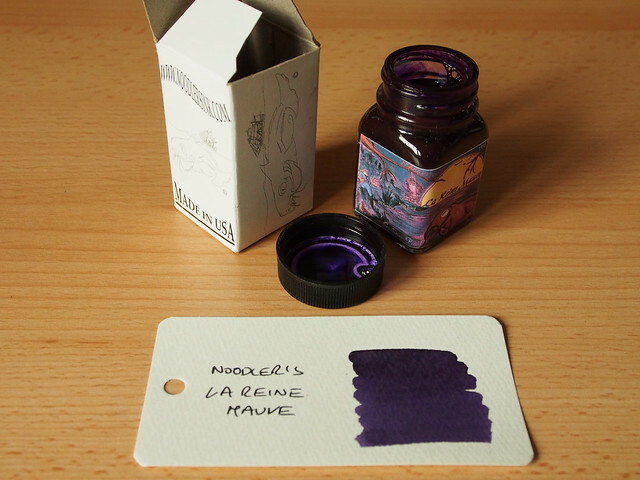 The fantastic colour (along with the waterproof properties) made me really want to like this ink. The higher than normal price doesn’t really put me off – it’s the erratic ink flow. I will try it in other pens when times allows, but only ones that are easy to clean. I can’t see it being a daily use ink until I can find a suitable pen. I bought a sample of this ink, and fell in love. It writes really well with my Pilot Metropolitan pen. Had no idea of its watercolor ability, as it quickly washes from my hand. Thank you for the review!